Mark “The Zuck” Zuckerberg, leader of the world’s evil lizard gang and CEO of Facebook, has been at the centre of wacky conspiracy theories for years. We know that he’s secretly part-reptilian; one part of a huge alien plot to overthrow the human race, mine the earth’s resources, and flee to the aliens’ home planet to live happily ever after in slimy, scaly prosperity. These all-powerful, shape-shifting scaly beings, known as the ‘reptilian elite’, include the British royals, Donald Trump, Miley Cyrus and Justin Bieber. They are said to be responsible for 9/11, horrific global conflicts and the Holocaust – and now the ’10-year Facebook photo challenge’. If you haven’t been living with lizards under a rock for the past week or so, your Facebook feed would have been cluttered with before/after style progress photos of everyone you know. Facebook users are posting side-by-side images of themselves, one being a 10-year old photo from 2009 and one from 2019, to see if or how they have changed. It seems like harmless fun, right? Not according to Reddit conspirators. In the age of information, I think it’s healthy to question the motives behind what we see online. One Reddit user has done just that, and questioned how long it will take us to realise that Facebook’s recent ’10-year photo challenge’ is merely a method of training Facebook’s facial recognition tech. Some Reddit users agree with the original poster, that Facebook has an ulterior motive with this photo challenge. One responder even pointed out that Facebook may be following Snapchat’s alleged strategy – face-swaps, filters and cute animations which fit to our faces may actually be recording our facial information for government and marketing purposes. If you consider the way we move our phones around our faces in order to get these filters to work, thinking about this becomes a little scary – we almost give 360-degree footage of our faces to big data companies. Luckily there’s no proof of mass data abuse from this – yet. Others argue there is no reason that Facebook would use this challenge to harvest data – because, put simply, they’ve acquired most of this information already. People who take part in this challenge are most likely to be people who regularly post photographs of themselves on the platform, so Facebook has their data anyway. One scary theory that fits in between the two above is that Facebook is utilising this challenge to train its AI bots to recognise how humans age – creating the potential for Facebook to build an eerily accurate tracking tool. A significantly less creepy theory put forward on the forum suggests that Facebook has experienced a steady decline in viewership: people are spending much less time on the platform and some are deleting it. The ’10-year old photo challenge’ may be a PR stunt to push FOMO to the forefront of the minds of people who may be spending less time on Facebook with an intrusive reminder of all the good times they’ve shared on Facebook. So, are the allegations true? 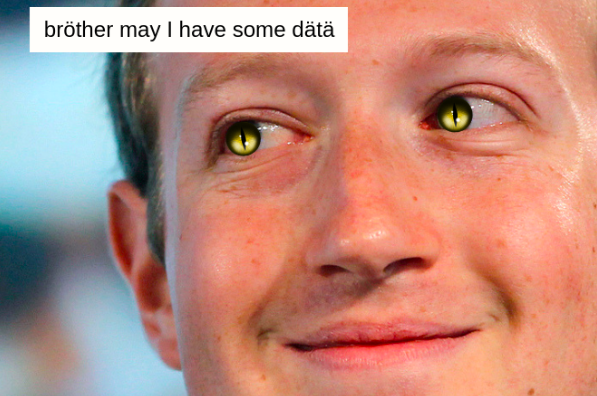 Is our boy Zuck a half-lizard, trying to control and then overthrow humanity? We’ll probably never actually know for sure, but his creepy obsession with collecting, curating and selling off our data for his own slimy benefit doesn’t exactly help his explicit denials of having any secret evil lizard DNA. Zuckerberg has denied that Facebook is using the challenge as a means to collect facial recognition data, insisting the challenge is a “user-generated meme” that Facebook played no role in creating. He’s also sworn he’s not a lizard, but I’m not sure I really believe him. In the words of a Redditor under the pseudonym “Rtificiallrrelevance” (username checks out), the most dangerous dystopia is the one we don’t realise we’re in. So, this Facebook challenge, regardless of whether it was designed to capture our data or not, should be taken as a reminder to think deeper about what we’re posting online, and the potential implications of our online actions.